The Lasik Jargon! LASIK, iLASIK or Ultra LASIK? There was a time when those seeking to get refractive error correction mostly prefered to rely on LASIK. But today, even though LASIK continues to remain a preferred choice, limitations to this surgery have been identified. In fact, the discovery of these limitations has led to the medical fraternity foraying into developing newer techniques for vision correction. Before we delve deeper into the options, let’s understand the technology of LASIK. Laser in-situ keratomileusis or LASIK as it is commonly known, is a popular surgery used to correct vision in people. The procedure is usually prescribed for people who are nearsighted, farsighted or have astigmatism. Usually, most refractive error correction surgeries focus on changing the shape of the dome-shaped transparent tissue (cornea) in front of the eye. The desired result of laser surgeries is to refract the light rays precisely on the retina (back part of the eye) to produce clearer and sharper vision. LASIK eye surgery is the most common type of refractive surgery. But there are other options as well. These options include laser procedures like PRK, LASEK and EpiLASIK as well as intraocular lens procedures. For many patients, these alternatives are actually a better choice because of their specific vision conditions. For instance, extreme dry eyes, thinner corneas and higher degrees of glasses prescription are all potential reasons to consider LASIK alternatives. In all cases, as a practice, the doctors always examine the eyes of the patients prior to deciding upon the technology to be used for the vision correction surgery. 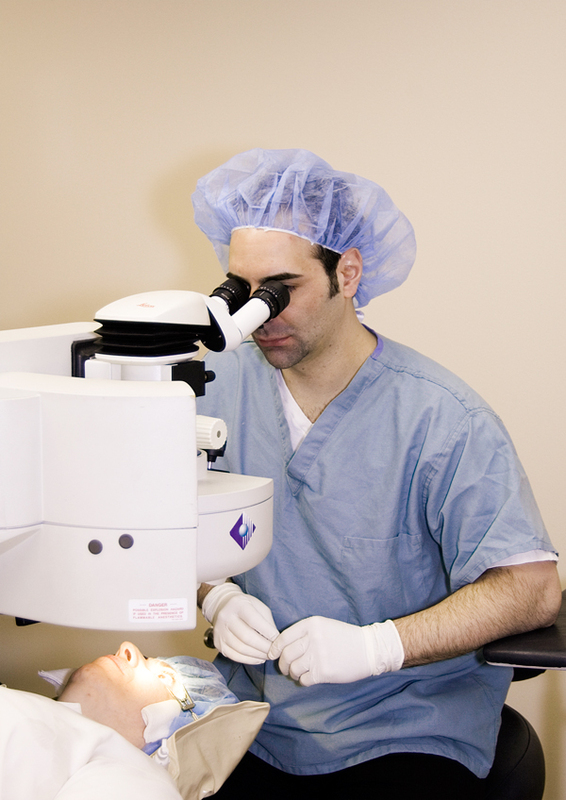 Additionally, for patients who are not able to meet the requirements of LASIK, doctors also prescribe LASEK. The technique used in LASEK is a mix of methods used in PRK and LASIK. EpiLASIK, on the other hand, is a relatively newer method used to cure refractive errors. The fundamental difference between LASIK, LASEK and EpiLASIK lies in the method of surgery used. In EpiLASIK, the surgeon uses a blunt, plastic oscillating blade to separate the sheet over the cornea. This further reduces the risk of any infection spreading particularly in complicated cases where the cornea is flat. Wavefront-guided LASIK is another variation of LASIK surgery in which, rather than applying a simple correction of only long/short-sightedness (myopia or hypermetropia) and astigmatism (only lower order aberrations as in traditional LASIK), an ophthalmologist applies a spatially varying correction, guiding the computer-controlled excimer laser with measurements from a wavefront sensor. PRK or Photo Refractive Keratectomy is one of the first surgeries to receive FDA approval. However, as a practice this technique is being phased out due to its long recovery time. The latest option in the category of refractive error correction surgery is bladeless LASIK. Some of the common proprietary names that manufacturers of LASIK technologies use for the methods in this category are Intralase, Intra-LASIK, iLASIK and Z-LASIK. When compared to the other categories of technique, the only difference with bladeless LASIK lies in the way the flap is created to reach the cornea. The new machines in this category are sleek, easy to use and of course the surgery is far safer with no blade involved. The aim of a refractive error correction surgery is to give the patient a more optically perfect vision, which is achievable with accurately predicting changes that occur during healing and other factors that may have to do with the regularity/irregularity of the cornea as well as the axis of any residual astigmatism. Aberrometry is usually performed before this procedure as a part of initial evaluation. On an average, a refractive error correction surgery usually takes less than 30 minutes. The patient is made to lie on the back in the operating room containing the laser system. The laser system includes a large machine with a microscope attached to it and a computer screen. First, the eye is numbed with a few drops of topical anesthetic. The eye will be positioned under the laser, and an instrument called a lid speculum is used to keep your eyelids open. Flap creation is done either manually using a microkertome (LASIK), or with the use of Femtosecond laser (Intra-LASIK or iLASIK). The next step of the procedure uses an Excimer laser (193 nm) to ablate the corneal bed (to reduce the refractive error). The laser vaporises the tissue in a finely controlled manner without damaging the adjacent stroma. No burning with heat or actual cutting is required to ablate the tissue. During this stage, patients usually feel that the vision has become blurry. After the laser reshapes the cornea, the flap is repositioned and serves as a natural bandage for the healing process. It remains in position by natural adhesion until healing is completed. Thanks to the latest technology, refractive error correction surgeries have become easier and faster. The patient rarely feels any pain or discomfort and can resume most of his or her routine activities almost immediately after the surgery. Though patients may be advised to follow up with the doctor once in the first 24 to 48 hours after surgery and later at regular intervals in the first six months. Eye drops (usually antibiotic, anti-inflammatory and lubricating drops) need to be applied for few weeks to months after any such refractive error correction surgery (Ideally, as advised by the doctor). Every technology has its fair share of advantages when it comes to refractive error correction. In fact, the newer methods come into existence only when the medical fraternity comes across limitations or restrictions in the existing method of practice. For instance, LASIK offers a lot of advantages and is one of the most common refractive surgeries performed. It is proven to correct vision in most of the cases. Recovery is also quick and no stitches are required after LASIK. Enhancement after LASIK can be done for patients who need it. LASEK on the other hand is a preferred option for patients with flat corneas as it will be safer. iLASIK is the bladeless version, an enhancement over the existing options. Recovery time in iLASIK procedure is also shorter. iLASIK: Advanced LASIK surgery in which the corneal flap is made using femtosecond laser which is totally controlled by the computer settings for the machine. It is a precise and bladeless procedure and does not involve manual cutting with microkeratome. Visual recovery and healing is faster with lesser flap related complications when compared to conventional LASIK. Ultra LASIK: It also utilises femtosecond laser to make a thinner corneal flap. It is a customised LASIK with lesser surgical complications and faster recovery. LASIK: This is the conventional method that uses microkeratome that makes the corneal flap using a blade. If a mechanical microkeratome is used, a ring is placed on the eye and high pressures are applied to create suction to the cornea during the procedure. The microkeratome is a cutting instrument which is attached to the suction ring and has a blade that cuts the cornea. Excimer laser is used in all types of LASIK procedures to ablate the cornea and correct the underlying refractive errors. In the United States, the FDA has approved refractive error correction surgery for age 18 and over. But prior to accepting a patient for any refractive error correction surgery, it is important for the patient’s eye prescription to be stable for at least one year prior to surgery. The patient is usually examined for pupillary dilation and educated about the exact condition prior to the procedure. For contact lens wearers, the rules are a little different. Contact lens wearers are asked to discontinue wearing the lenses before the operation. The period for which they are required to avoid wearing contact lens, depends on the type of lens that they use. For instance, soft contact lens wearers need to stop 2 weeks before the operation and the Toric soft lenses or rigid gas permeable lens wearers need to stop three weeks in advance. On the other hand, hard contact lens wearers have to stop 4 weeks in advance. These guidelines are in accordance to the information made available by FDA. Before the surgery, the patient’s corneas are examined with a pachymeter to determine their thickness, and with a corneal topography machine, to measure the surface contours. A typographer creates a precise topographic map of the corneas which aids in selecting the patients whose eyes are suitable to undergo the procedure and also to decide the surgical settings of the laser machines during the procedure. After the complete and thorough eye examination, the doctor lets the patient know whether or not they are a good candidate for refractive error correction and also discusses the risks, benefits, and alternatives of the surgery.